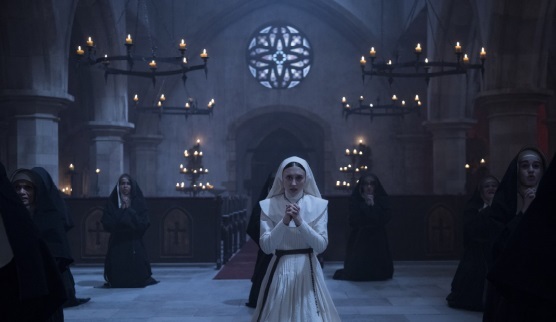 In case you can’t quite recall how the demonic creature of the new supernatural horror thriller The Nun was first introduced in the Conjuring movies, specifically 2016’s The Conjuring 2, director Corin Hardy effectively brings you up to date. With a few edited moments showing Patrick Wilson and Vera Farmiga as the real-life paranormal investigators, Ed and Lorraine Warren, Hardy briefly revisits those home basement scenes where Lorraine’s painting of evil comes to life before her; at least, a vision of it. 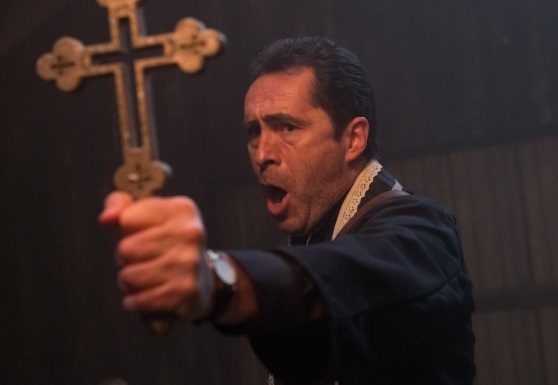 In fact, while this fifth installment of the Conjuring series can be viewed as a standalone feature, the new film will eventually circle back at the closing to the Warrens at university giving a lecture regarding an exorcism, reminding us, with a glance of a familiar face in the audience, where it all began. ‘The Following Occurred in 1952’ a title informs, suggesting, but without saying, that what we’re about to see might have been true. The two previous Conjuring adventures were purportedly based on real events. This one is not. But it’s a spooky enough intro. At a secluded abbey high above the mountains of Romania, at the end of a long, dark passage that produces its own mist across the floor, there’s a room with a locked door that displays a warning sign in Latin. It reads, ‘God Ends Here.’ Carrying a special key, two nuns are about to enter. “We have no other choice,” the older nun states. What follows is supernatural mayhem. With the door now open, the older nun is literally dragged into the room by something unseen. The younger nun runs, then purposely hangs herself by wrapping rope around her neck and leaping from her bedroom window. Exactly what has just happened and why is not altogether obvious, but once the young nun’s hanging body is discovered some days later, the Vatican wants things investigated. 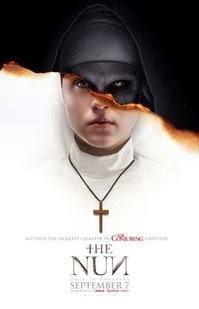 During the following few scenes, the film jumps locations, taking us from Romania, where the awful events occurred, to Vatican City, where the religious authorities order Father Burke (Demian Bichir) to investigate exactly what happened in the abbey, to London, England where the priest is ordered to enlist the assistance of young American novice, Sister Irene (Taissa Farmiga), and back again to the mountains of Romania. Why Sister Irene is specifically required is never quite explored. As she states to Father Burke, she has no knowledge of either the abbey or Romania, but as the Father explains, if the Vatican wants her help, then it has to be important. Once back in the small Romanian village at the foot of the mountains, Father Burke and Sister Irene engage the help of a French-Canadian who has made Romania his home, a young man who likes to be called simply Frenchie (Jonas Bloquet). It’s Frenchie who originally found the nun’s body hanging from a rope, and it’s he who’ll be taking the priest and the novice by horse and cart up into the mountains, through the woods, and back to that mysterious looking abbey where something occurred. “Now you’re in the dark ages,” the young man tells them. Inspired not so much from real events but more from the British Hammer Horror Dracula movies of the sixties, the ones where the horse pulling the carriage through the woods won’t go any further because it senses something evil, Frenchie tells his two passengers, “We walk the rest of the way.” And like those same Dracula movies where the travelers walk past all kinds of makeshift wooden crosses hanging from trees to protect their way, they finally arrive at the front doorsteps of the Gothic looking abbey itself. With its many ominous looking high pointed towers and turrets, and its endless series of rooms, plus the graveyard around it, the building could easily be the same place that once housed Christopher Lee and his coffins. There’s even a bierkeller type bar down in the village where the frightened locals huddle together, nursing their pints while the barman states, “Whatever evil is out there, it’s poisoning us.” And, amusingly, the fact that many of these scenes were shot on location in the real Transylvania somehow solidifies the Hammer connection. From that point, The Nun incorporates every spooky element it can, including creepy knocks on doors, whispers in the hallway, shadows seen at the corner of the eye, images of nuns praying in front of a headless Christ on a cross, candles that light themselves, crosses on the wall that slowly turn upside down, and locked doors that suddenly open. And that’s just for starters. Once the priest and the novice get to the bottom of things and finally locate that dark, misty passage where God’s presence ends, all hell, in the most literal sense, breaks loose. The issue you might have, as with several recent horror tales of its kind, is nothing is really explained. The fantastic and the supernatural spill over the floors and against the walls without us ever quite understanding how or why. A demonic presence instilling frightening visions so that our leads think that what they’re seeing is real is fine, but much of what we witness is actually supposed to be real, not visions, and it all defies logic. The best we get is the priest telling the novice that what they’re experiencing are simply strong, evil powers, giving license to writer Gary Dauberman to invent and to go as far as he wants without the need to explain the rules. There’s also the issue of the demonic nun. It wants to get out of hell and enter the real world, but to what end? What’s its plan? Evidently, all it appears to want to do is to possess a body and simply wreak havoc. Wasn’t that that the same basis for the demonic looking thing in Insidious? At this point, The Nun needs something more. 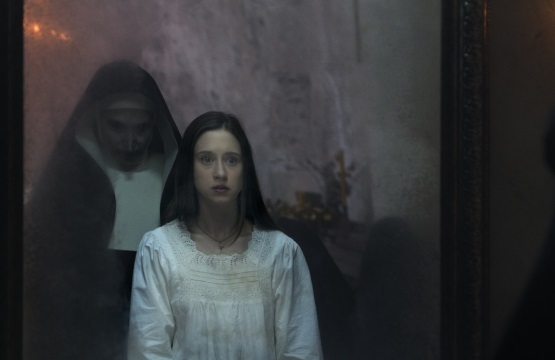 Taissa Farmiga as Sister Irene grounds the film well, and even though most will consider the film’s title is a reference to the demonic presence in the nun’s habit, it could easily apply to Sister Irene herself. The Nun is really her story. Interestingly, Taissa is actually Vera Farmiga’s younger sister, and while her character has no connection to Vera’s Lorraine Warren, by casting the sister as the lead, the younger performer’s mere presence ensures an indirect though continuing nod to the Conjuring universe. Demian Bichir has an earnest enough approach to his Father Burke, but it’s Jonas Bloquet’s Frenchie that may ultimately prove the audience favorite. While those around him use crosses, holy water, and The Lord’s Prayer as weapons in the fight against evil, Bloquet proves that when the time requires it, a fully loaded, double-barreled shotgun can work just as well.